Very much a 'catch all' field that includes studio produced art glass from the tail end of the 19th century through to the current day. 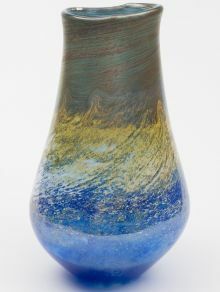 It includes what might be considered the broadly 'traditional' work of the Nancy school of glass making (not including Emile Galle whose overlay glass is dealt with elsewhere), the principle exponent being Daum whose skill set included wheel engraving, mould blowing, acid etching and pate de verre (literally ground glass paste), all typically signed and marked with the double cross of Lorraine. 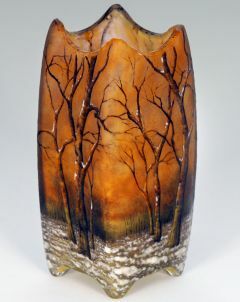 A Daum Nancy landscape vase. Daum obviously wasn't the sole practitioner of any of these techniques. Gabriel Argy-Rousseau and Almeric Walter spring to mind as perhaps the most accomplished craftsman in the pate de verre field. However the list of French art glass makers is a long one that includes Legras, Muller Freres, Val St Lambert, Baccarat, Schneider and countless others. 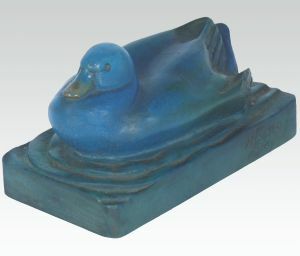 An Almeric Walter pate de verre paperweight, circa 1910. Just over the border into Austria, the Vienna concern of J & L Lomeyr found inspiration from the East to create their Persian inspired intricately enamelled glassware, but their Bohemian neighbours Loetz produced by far the brightest and dynamically formed pieces of art glass. More often than not produced in fantastical iridescent colour combinations with exotic names like Phanomen and Papillon in bold organic and asymmetric forms, sometimes enhanced with robust metal mounts. Perhaps the striking appearance of Loetz is just as well, as it is rarely marked and as a result has spawned many lookalikes. Whilst some of the bold decorative affects are similar to those used by Louis Comfort Tiffany in America, Tiffany was no mimic and certainly capable of original design particularly in the field of stained and leaded glass – there can be nobody who is unaware of the classic Tiffany lamp. Alessandro Pianon for Vistosi (Murano) 'Pulcini'. When it comes to pushing the boundaries of glass techniques then one probably needs to look towards the work of Venini and his cohorts in Venice. The application of multi-coloured tiles to form pezzato, occhi or murrine effects on glass is the epitome of the glass makers' skill. However, not to take themselves too seriously, they did also use humorous and light hearted modelling to produce comical figures and childlike animals – a far cry from the ubiquitous Murano clowns and multi-coloured fish. 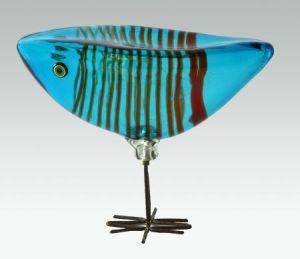 Scandanavian glass by Tapio Wirkalla. Perhaps at the opposite end of the spectrum for art glass is the sleek lines and often restrained palette of the Swedish and other Scandinavian glass makers. The strong intaglio cutting and also the subtle colour combinations of Sven Palmquist for the Orrefors factory are perhaps worthy of note and similarly so Kosta, where often form in and of itself without the addition of decoration was sometimes considered enough. 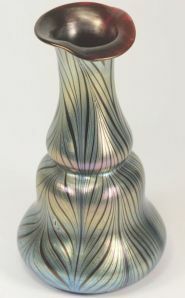 However, Orrefors particularly could also produce bold effects with its graal technique utilising etched, carved and coloured glass cased within a vessel of a differing colour. Flying the flag for the future Norman Stewart Clarke. Domestically the Whitefriars concern of James Powell & Sons straddled the 20th century making museum copies and restrained pieces in the early decades, culminating in the archetypal pieces of the 1960’s and 70’s with brightly coloured banjo, bark and drunken bricklayer vases amongst their repertoire. Innovation continues in the field of art glass making with many of the previously mentioned larger concerns still in active production alongside many smaller artisanal one man bands such as Norman Stewart Clarke – so the future looks promising for tomorrow’s glass collectors.